Here is the “professional recipe” for tonkotsu ramen as promised! Bring frozen bones to room temperature in plenty of water. It should take about 2 hours. 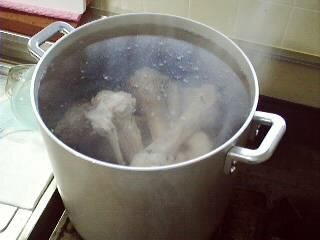 If you cook frozen bones directly, the blood will solidify and will be very difficult to get rid of. If you can get fresh bones, skip this step. 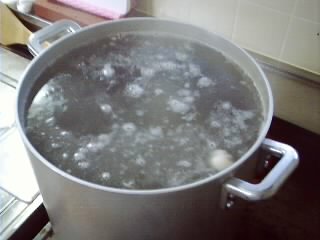 Fill a very large cooking pot with water and bring to boil. Switch off fire as soon as the water boils. Drop in the bones and let cool. This process will help you get rid of the blood and blood vessels easily. Leave it to cool down for 30~40 minutes. 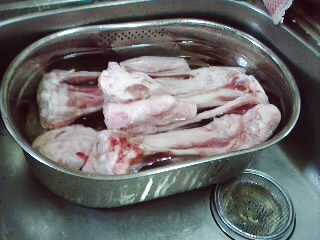 Drain the water off the bones in a large strainer. Check and take off any blood or blood vessels from the bones. Don’t forget to clean the pot! Break all the bones in two with a hammer. 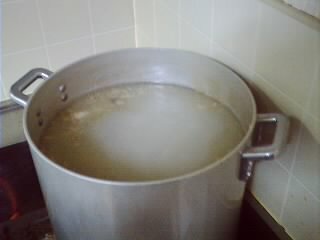 Fill the pot again with clear water and bring to boil. Keep cooking over a strong fire and scoop out foam and unwanted matters coming up on the surface (this should take 20 minutes at the most). 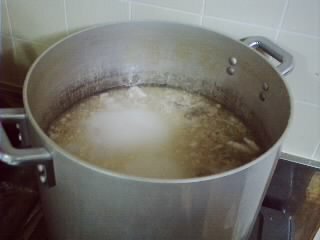 As the bottom might get hotter than near the surface, stir with a large ladle from time to time. 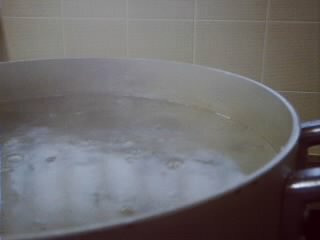 If the inside of the pot over the water surface gets clogged with matter or gets dark, switch off fire, clean with a clean cloth and switch fire on again. 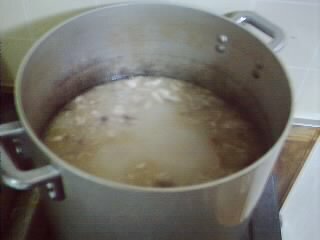 Above picture shows the soup after all unwanted matters have stopped coming up. 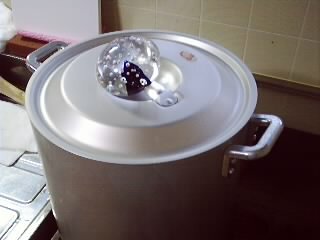 Cover with a lid and a weight to prevent steam coming out from under the lid. Keep simmering on a low fire. That’s how it looks after 1 hour. That’s how it looks after 3 hours. That’s how it looks after 6 hours. That’s how it looks after 10 hours. And after 12 hours (start early in the morning!)! Keep cooking. Remember you are aiming at 3.5 litres of soup. After 12 hours you may raise the fire to accelerate the cooking. 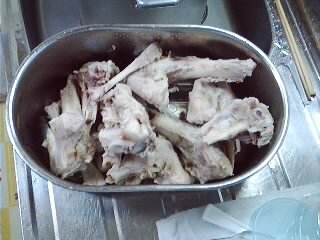 This is how the bones will look after 15 hours of cooking! 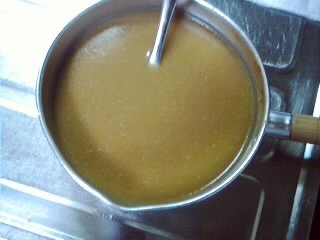 Filter the soup and here you have your tonkotsu base soup ready! 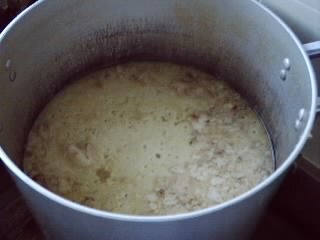 After that it is up to you and your preferences: add miso, tofu, salt, sesame oil, garlic chips and your little secrets! Awesome! Thank you for this recipe. I’ve been looking for tonkutsu ramen recipe for me to follow as I’ve been craving for it. 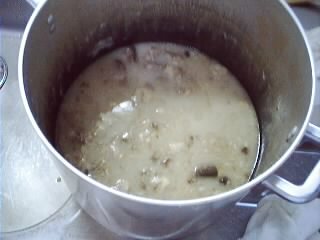 Well, I just hope that this experiment of mine will be a success and followed religiously this professional recipe. Also, boyfriend will be happy for this preparation. Thank you for this recipe. 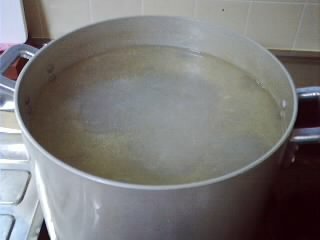 It is my first attempt and I am making a large batch with the intent to freeze most. 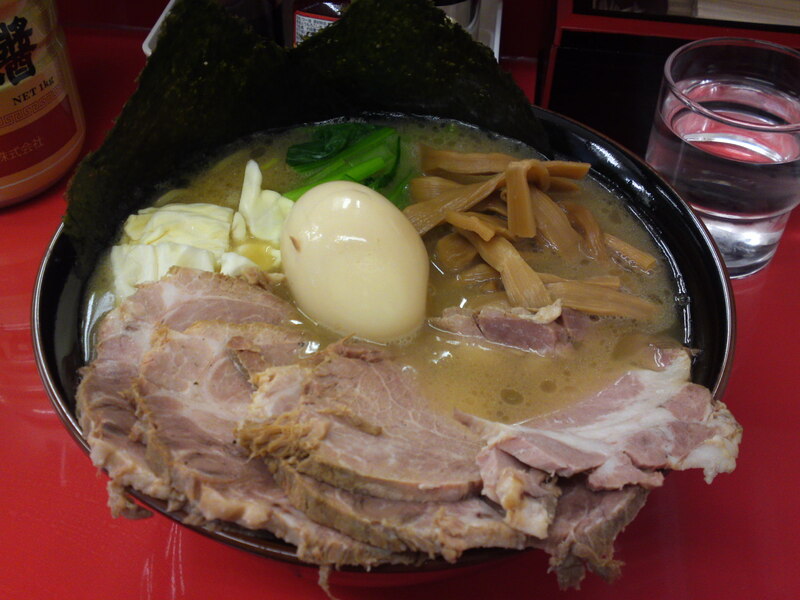 I plan to do my best to capture the spicy miso ramen so popular in Yokosuka, Japan. I will use white miso, soft boiled eggs, bean sprouts, bamboo shoot, nori, corn, green onion, a little shichimi and hint of sesame and chili oils. just spoke to a friend. He brought up a question of a difference between induction and solid fire, what do You know sir? I got bones with quite some meat on them and also they were already cut using a saw apparantely. So i pretty much did what recipe says ,but didnt break the bones as they are cut already. Now cooking it on a low fire covered properely but the problem is: the liquid doesnt seem to reduce – there is still pretty much the same amount of water after about 20 hours of cooking. i measured the temperature each time before raising up the fire (induction actually) about every 3 hours and it was about 72 C at the beggining and 100 now and still full pot. 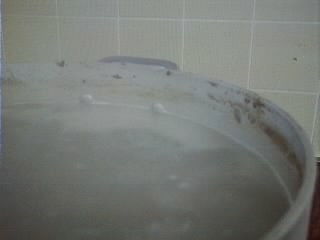 It dont seem to be possible to reduce it with a lid on. Can You help? Have you checked that the fire is n all the time? well, it offs every couple of hours, I admit that during night time it stayed off for say two hours. You think this is why the liquid reduced only about half inch? All I can say is that any reduction takes place because you allow steam to escape the pot. If your seal on the pot is so good (like a pressure cooker) then you’ll always end up with nearly the same amount of liquid as when you started. Keep what you have, but try cooking it at low temperature. You want to see some steam coming off the broth — in other words simmer it. 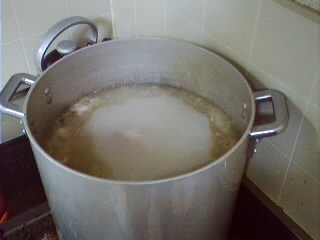 In a few hours or shorter time, you should have a reduced broth. 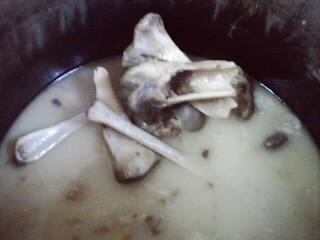 Since you’ve already boiled the bones for a long time, you can take the bones out. You’ve already gotten all the flavor out of the bones. I suppose it’s best to use a lid that either has one of those holes to let steam escape or if the lid doesn’t have that then leave the lid slightly opened to let steam escape? I haven’t tried this recipe but from experiences I’ve had trying to reduce other liquids this has been a problem. how about adding soy sauce. and how about mirin? Je viens de découvrir votre blog qui est une mine d’information. Plutôt génial quand on est gourmet et qu’on vit au Japon. C’est tellement difficile de trouver certains ingrédients à bon prix. J’ai une petite question, où trouvez-vous les os de porc ? Savez-vous où trouver des os de bœuf ? I’m sorry, I only know enough french to read what you wrote, not to write in French. Hopefully you can read English. I live in the US, so I don’t know about where you live, but almost any Asian grocery store should have them. My local Asian grocery has both pork and beef bones for very cheap. This whole recipe costs me about 8 US dollars, including the onions, garlic, and miso that I add at the end. *on peut trouver os de porc et os de boeuf à une épicerie asiatique. Ils sont difficult à trouver except in large cities. Of course you can read English, ha-ha. The recipe is written in English. Silly me. Thank you for the recipe! I did some research on tonkotsu recipes in japanese blogs and sites and decided to give this one a try. I had some trouble breaking the bones with just a hammer so I used a saw to help them break. I’ve had american style tonkotsu ramen before but none compared to the tonkotsu ramen I had in Tokyo. Your recipe looks easy and good. What are some of the toppings? The best ramen I had was a corner shop in Shimbashi, they had dark brown strips of something that almost resembled noodles. For things you could add at your table was ginger and something that was red, like dried flakes of something. Must it be reduced? I seen giant kettles with big locking lids at that particular ramen shop. I was thinking that if I could find something similar maybe the broth will go further? I’m a complete amateur when it comes to cooking Asian food. I would love to give it a good try. Thanks for the info. Toppings is somewhat of personal preference! It is open to a lot of experiments! is it easy to use a hammer to break the pork bones? i can get pork femur bones but not sure if i can break them. Well, you do need some strength, but it is worth it. Does the type of pork bones used matter? I have seen some recipes with trotters only, some with neck bones primarily, some with leg bones…is there more connective/collagen tissue in any particular bone that would be advantageous for flavor/texture? –Still learning! Not really, but try to find very fresh bones with plenty of cartilage and marrow! Thank you for sharing your recipe ! I’m curious though, Your ingredients are quite simple and minimal (except for your last secret ingredients), you didn’t add any kelp, rice wine, dried anchovies, a lot of vegetables/fruits that’s being used in a lot of Japanese Ramen Recipes.. and I always thought, more ingredients, deeper or better flavor. This is only the basic recipe. Keep me informed of your experiments! This is a lot of base, how long will it keep in the fridge or freezer? Just separate into many plastic bags and freeze them! Thank you SO much for the recipe. I’ve become a ramen-making nut recently and have tried about five recipes with various success. They were good, but didn’t have the tonkotsu-y white beauty that this one does–probably because they used pork neck bones/meat and not leg bits, I’ve been told. 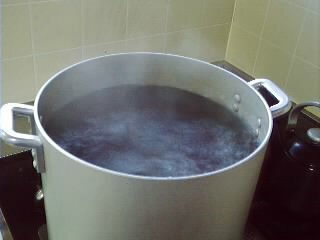 A big part of it is making sure you wash out the blood after you do the first boil. That’s the biggest reason the soup will get dark. Very true! Thanks a lot! Robert, when you clean the bones, do you clean out the marrow? or just the red coagulated blood? Dear Buder, do not clean the marrow. It will naturally melt later! What kind of miso are you talking about to make the tonkostsu soup? Is it a soy miso curd? 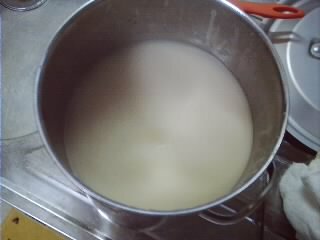 Any kind of miso paste (fermented soy beans paste, not curd/tofu) is fine. It all depends on your preferences. I don’t know about milk although I heard of it being used. You could definitely use white miso and/or finely ground sesame seeds. A touch of corc\starch could be ok, too!